Day 4, we have very few spoilers left over from yesterday and very few for today. 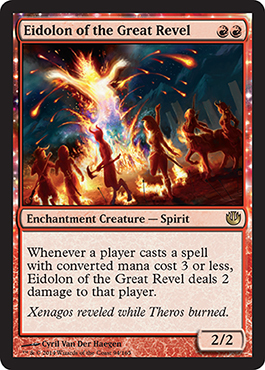 This could improve Red Deck Wins some, but there is the downfall of playing small things. Maybe not the best for Standard, but it has a place, I'm sure. 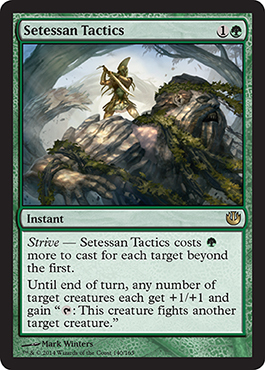 And we have the wonderful Strive mechanic back. This time you give each creature you target +1/+1 until end of turn and allow them to fight another creature. Adds onto the fighting aspect of some Gruul cards from the RTR block. 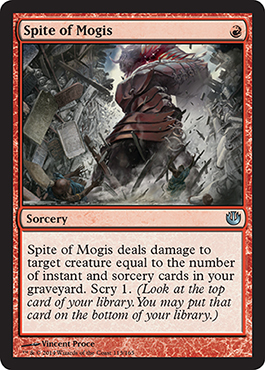 More Red Deck Wins or some sort of U/R or W/U/R control allowing you to decimate your opponent's creatures? Our third revealed god for the set. Essentially limitless mana with this guy (as you'll keep adding more and more) and no maximum hand size. I expect some sort of Bant Lifegain to happen. 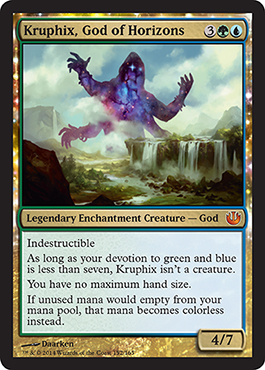 Imagine, save up tons of colorless mana, cast Sphinx's Revelation, draw 10 cards or something while triggering Archangel of Thune, no need to discard, keep going. It's perfect for something like that.